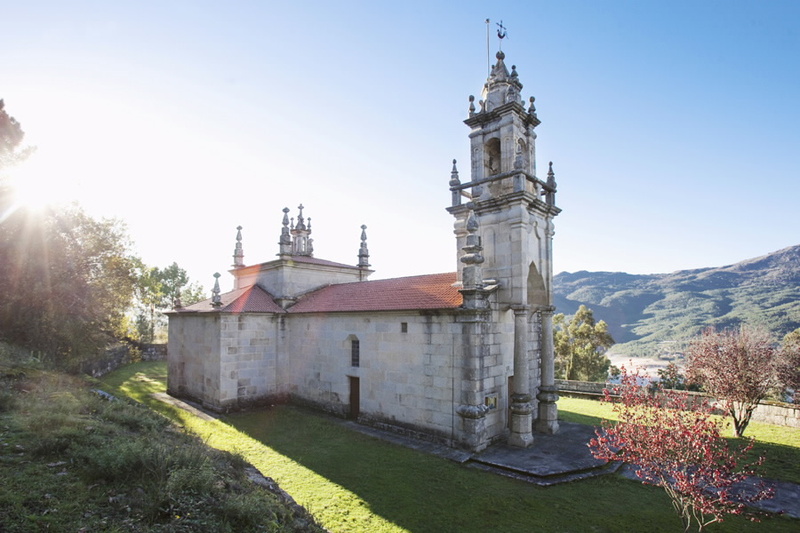 In Lobios, an Ourense municipality that belongs to the region of A Baixa Limia, is the hidden gem that is the church of San Salvador de Manín. It is a building with a unique peculiarity: it was moved stone by stone twice, in 1769 and in 1992. This church was built in 1764, being abbot Damián Vélez de la Llana, as indicated by an inscription found on the right arm of the building’s transept. The temple is one of the greatest exponents of the Galician Baroque in the region. The building has a Latin cross plan, with a main nave of three sections, and presents the characteristic elements of the Baroque churches. From the outside, the base of the dome (above the crossing) and the large tower integrated into the frontage are especially striking. The external decoration of the church is constituted mainly by pinnacles finished in ball, typical of the time. Inside, both the relief sculpture of the major altarpieces and the reliefs of Adam and Eve among Atlantean children (located in the doors of the sacristy, behind the altarpiece) stand out. San Salvador de Manín has a lot of history, and two moves. The first one, in 1769, was caused by the lack of parishioners in the original church site (Manín). Thus, the church was moved stone by stone to the neighbor Aceredo, where it remained for more than 200 years until in the early 90s it was decided to build a reservoir in Aceredo; the Lindoso reservoir. At first it seemed that the church was going to get lost under water, but the residents of Aceredo locked themselves in it, until it was accepted to move the church to Compostela (another village within the ambit of the parish of Manín), where it is located nowadays. The different locations of the church gave rise to the two names with which it is known: San Salvador de Manín (due to the first village where it was built) and Aceredo´s Church (due to the place where it was until very recently). This curious church is an interesting stop within the A Baixa Limia region, along with the Serra do Xurés Natural Park, the wonderful Santa Comba de Bande and the ancient Aquis Querquennis, among others.